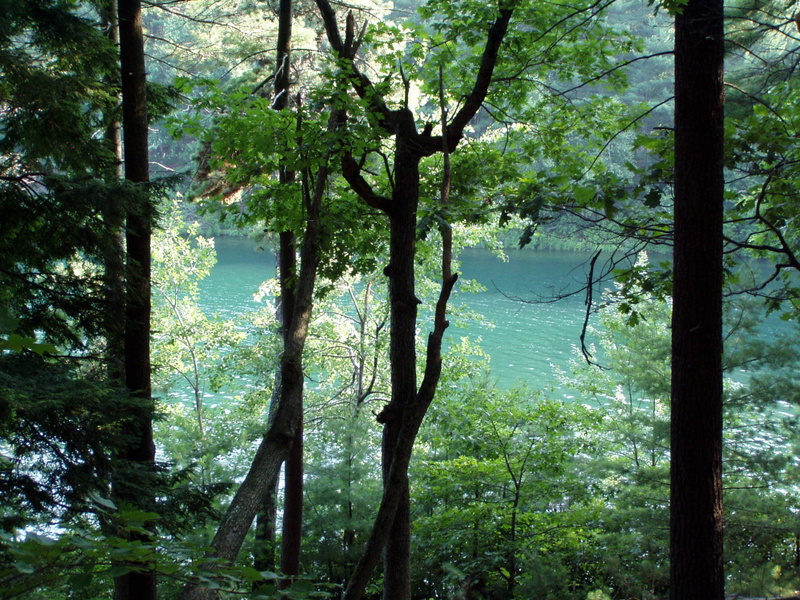 Walden Pond was once home to the renowned author, Henry David Thoreau. Now part of the Commonwealth of Massachusetts’ Department of Conservation and Recreation (DCR) Forests and Parks system, Walden Pond State Reservation comprises 335 acres of protected open space, where visitors come to experience the pond that inspired Thoreau. They also come to hike, swim, fish, canoe/kayak, and cross country ski. In 1845, Henry David Thoreau came to Walden Pond to live. He stayed for just over two years. He didn’t come to inspire a myth or a legend, or to create movements, or to make a name for himself. He came instead for the simplest of reasons: to live simply in nature and to discover what it could teach him. 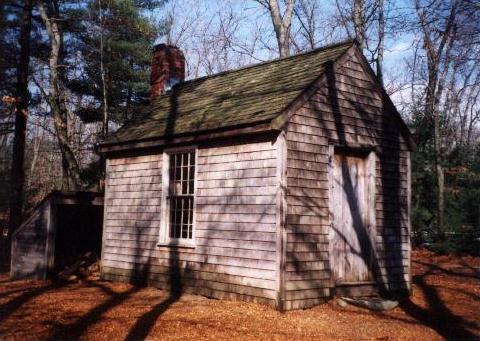 In March of 1845, Thoreau began planning and building his one-room house. He moved in on July 4th of that year. He studied natural history, gardened, wrote in his journal, read, took long walks, and drafted his first book, A Week on the Concord and Merrimack Rivers, a story of a paddle trip taken with his brother in 1839. He also made the first accurate survey of the pond. By no means a hermit, he frequently walked to Concord village, entertained visitors at his house and hired himself out as a surveyor. In September of 1847, Thoreau completed his experiment in simplicity and returned to live in Concord. 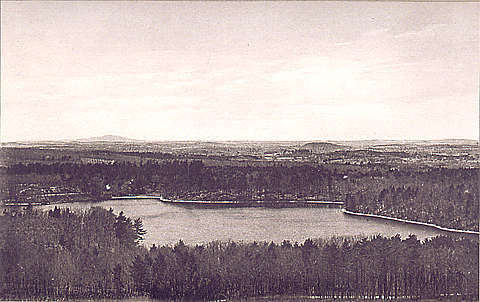 In 1922 the Emerson, Forbes, and Heywood families granted approximately 80 acres surrounding the pond to the Commonwealth of Massachusetts with the stipulation of “preserving the Walden of Emerson and Thoreau, its shores and nearby woodlands for the public who wish to enjoy the pond, that woods and nature, including bathing, boating, fishing and picnicking.” Middlesex County was given the responsibility for management of the reservation. In the summer of 1936, some 485,000 people visited Walden Pond, with Sunday crowds numbering as high as 25,000 visitors. Today, it is estimated that approximately 700,000 people visit the reservation each year. In an effort to balance public recreation with protection of these resources, the DCR established a ‘people capacity’ at the park to ensure a positive visitor experience and to maintain the integrity of the resources. By the time the Commonwealth acquired the property in 1922, much of Walden’s forest had been cut down. The woods have since grown back, so that the vegetation resembles the hardwood and softwood mix of Thoreau’s day, including berry bushes, sumac, pitch pine, white pine, hickory, black birch, and oak. Stumps of some of the 400 white pines planted by Thoreau and Emerson, leveled by the great hurricane of 1938, used to be found above Thoreau’s house site. Wildlife of Thoreau’s time can still be found here. Gray squirrels, chipmunks, and rabbits are common. Skunk, raccoon, and red fox are active at night, but can occasionally be seen shortly before sunset or after sunrise. Kingfishers, blackbirds, chickadees, blue herons, and red-tailed hawks can often be viewed flying among the trees or over the water. In the spring and fall, migratory ducks and geese pass overhead and land in nearby wetlands for food and rest. As noted by Thoreau, the pond “is not very fertile in fish. Its pickerel, though not very abundant, are its chief boast.” The pickerel disappeared around the turn of the century, and the pond is now stocked annually with trout. In addition, sunfish, yellow perch, and small-mouth bass compete for crayfish. Walden Pond is a 102-foot kettle hole pond formed over 12,000 years ago when the last glacier to cover New England slowly melted away. It is Massachusetts’ deepest natural body of fresh water. As the glacier melted, large chunks of ice broke off and became surrounded with and covered by vast amounts of sand and gravel carried by streams flowing from the glacier. As the blocks melted, they left behind depressions that eventually filled with water. Because of this geological history, most kettle holes like Walden Pond have no streams flowing into or out of them. A replica of Thoreau’s house, constructed in 1985, and the location of his modest accommodations are available for viewing by the public. Year-round interpretive programs and guided walks are offered. Visitors can enjoy the new state-of-the art, LEED-certified Visitor Center opened to the public in 2017, with our new exhibits, Ken Burns’ and Ewers Brothers film “Walden,” and browse the updated Shop at Walden, run by the Thoreau Society. The interpretive staff at Walden Pond State Reservation offers a wide array of programs for visitors. Children’s seasonal programs include nature crafts, story time, and the Junior Ranger series. Adult and family activities include poetry readings, tracking and walking programs, and Thoreau talks. Tour themes focus on the natural history of Walden Pond and Thoreau’s life and his impact on society. Accessible hiking and boating programs are scheduled in the spring and summer. When scheduled in advance, school and group tours are available. Reservations may be made by calling 978-405-2082. Only service dogs are allowed, and there is no bike riding within park grounds (there are bike racks to lock your bike on arrival). Walden Pond is a carry-in, carry-out facility. Please don’t litter. The Walden Pond Trail Map for 2010 and a Walden Pond Historical Pamphlet is available here. PARK HOURS: Please call Walden Pond State Reservation (978.369.3254) to obtain current park hours as opening and closing times change with the seasons. Walden Pond State Reservation is located in the towns of Concord and Lincoln in the Greater Boston area. All groups must have a reservation. Buses must follow our bus protocol. Pick up and drop off in the ‘Shop Lot.” Buses are not to park in the Main Parking Lot unless directed to do so. From Route 95/128 (north and southwest of Boston area): Take exit 29B onto Route 2 West. At 3rd set of traffic lights turn left onto Route 126 South. Parking is ¼ of mile down on left. From Route 93 (north and south of Boston area): Get onto Route 95/128 South. Take exit 29B onto Route 2 West. At 3rd set of traffic lights turn left onto Route 126 South. Parking is ¼ of mile down on left. From Mass Pike Route I-90 (Boston area & out of state): Get onto Route 95/128 North. Take exit 29B onto Route 2 West. At 3rd set of traffic lights turn left onto Route 126 South. Parking is ¼ of mile down on left. From Route 495 (north and west of Boston area): Take exit 29A onto Route 2 East. At 6th set of traffic lights turn right onto Route 126 South. Parking is ¼ of mile down on left. From Route 3 (north of Boston area & New Hampshire): Take exit 26 onto Route 62 West. Follow through Bedford Center and into Concord. At stop sign there Is a COLDWELL BANKER/Senkler Real Estate office directly in front of you; turn left. Follow road to the left around traffic circle, take next right onto Main Street, then take 1st left onto Walden Street. Follow Walden Street until you get to the traffic light at the intersection of Route 2. Cross Route 2, continuing straight onto Route 126 South (still Walden Street). Parking is ¼ of mile down on left. Come join us as we read kids picture books based on the life of Henry David Thoreau and various nature themes. Appropriate for children of all ages accompanied by an adult. This program will meet at the Walden Pond State Reservation Visitor Center, and if weather permits, we will move to the replica house where the wood stove will keep us warm as we read. Join a Park Interpreter for readings from the works of Henry David Thoreau. We will take turns reading from various passages, followed by a discussion. This program is most appropriate for teens and adults, but no prior literary knowledge is necessary. This program will meet at the Walden Pond State Reservation Visitor Center, if weather permits, we will move to the replica and gather around the wood stove, keeping warm. Meet a Park Interpreter at the Walden Pond State Reservation Visitor Center where we will start out our moderate one-hour guided ramble on one of Walden’s many paths. Learn about Henry David Thoreau, his stay at Walden Pond, his literary efforts, and his legacies. Appropriate for children 8+ accompanied by and adult. Wear winter boots and appropriate warm clothing. Bring walking sticks if you have them. Call 978-405-2082 with any questions. While Henry David Thoreau was living at Walden Pond, Frederic Tudor, the “Ice King of New England,” brought workers to the pond, harvesting tons of ice and stacking it in a giant pile at Ice Fort Cove. Come hear about this fascinating chapter in New England’s history. We will meet at the Visitor Center. If the trails permit, we will walk out to ice-fort cove and back (a 1.7-mile easy hike). Dress for the weather , ages 5+. Call 978-405-2082. Walden Pond State Reservation will host Tom Ricardi of the Massachusetts Birds of Prey Rehab Facility in Conway, Massachusetts, for an interactive presentation featuring live birds of prey at the Walden Pond State Reservation Visitor Center at 915 Walden Street in Concord, Massachusetts. Among the raptors featured may be a Golden Eagle, Peregrine Falcon, Red-tailed Hawk, Harris Hawk, Kestrel, Screech Owl, & Great Horned Owl. A retired Fish and Wildlife game warden and licensed wildlife rehabilitator, Ricardi cares for injured birds and operates a successful captive-breeding program. The event is free and open to the public. All children must be accompanied by a supervising adult. Regular parking fees apply ($8 MA plate, $15 out-of-state plate). While Henry David Thoreau was living at Walden Pond, Frederic Tudor, the “Ice King of New England,” brought workers to the pond, harvesting up to a thousdand tons of ice per day and stacking it in a giant pile on the shore. Come hear about this fascinating chapter in New England’s history. We will meet at the Visitor Center. If the trails permit, we will walk out to ice-fort cove and back (a 1.7-mile easy hike). Dress for the weather , ages 5+. Call 978-405-2082. Drop by the Thoreau house replica near the Walden Pond State Reservation main parking lot to discover from a Park Interpreter how and why Henry David Thoreau lived “a deliberate life” in Walden for two years, two months, and two days. We will have the woodstove going to keep us warm as we regale you with tales about Henry’s life and the importance of social and environmental legacies he left behind. All ages are welcome.